One of the largest earthquakes since a “swarm” of tremors began in the area last year has been felt in Surrey and parts of Sussex. The quake occurred about 2km below the surface near Newdigate, the British Geological Survey (BGS) said. The tremor was felt at 03:42 GMT and measured 3.0, equalling an earthquake felt in July. One resident of Redhill said his house was shaking for between four and five seconds. Dr Stephen Hicks, a seismologist from Imperial College London , tweeted: “Looks like another strongly felt earthquake as part of the Surrey seismic swarm this morning. “The depth and location looks like it’s the same as all the other earthquakes we’ve had in the region since April last year. 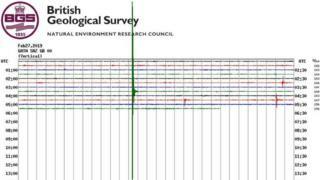 People on social media suggested the tremor was felt in Crawley, West Sussex, as well as Leigh in Surrey. The quake is the fourth to have been felt in the area in the last two weeks with a smaller tremor felt on Valentine’s Day, and two more on 19 February. Many have questioned whether the spate of tremors had been caused by recent drilling for oil in the area. In August, retrospective planning permission was granted for a secondary oil wellbore at Brockham. Dr Hicks said: “There’s nothing in the data to show that there was any plausible explanation why these earthquakes could have been induced or caused by drilling activities.